Soak in the hot tub or swim in the new pool or relax in front of the fireplace after a day of exploring the great outdoors of the beautiful Northern Rockies. Our condominium is a well maintained home away from home, with a fireplace, leather couches, full kitchen, comfortable sleeping accommodations, tiled floors, HDTV, VCR/DVD, and is a non-smoking unit. Two bedrooms - one with a queen-size bed and one with a full-size bed plus bunk beds - and one full bath downstairs. Kitchen, living room with fireplace and leather couches, and one full-size bath upstairs. We are located within Ptarmigan Village, a private mountain resort community set in a 52-acre private forest. World-class skiing at Big Mountain Ski and Summer Resort or swim, water-ski, etc. at Whitefish Lake, both only five minutes away. The area has several nice golf courses as well. The incredible sights of Glacier National Park (over 730 miles of trails) and its famed 'Going-to-the-Sun Road' is about 50 minutes away. And if that is not enough, the 'Bob Marshall Wilderness Complex' is just south of there with another 2500 square miles and over 3200 miles of trails to explore. Bring the camera, these areas simmer with wildlife! For shopping, nightlife, and great dining head into the historic town of Whitefish (only ten minutes away) for a little Old West ambiance. * Glacier International Airport (FCA - Delta, Northwest, Alaska, and Horizon) is 20 minutes away and Amtrak goes right into Whitefish. * For driving, take Interstate 90 until you are eight miles west of Missoula. Take US Highway 93 north towards Kalispell and Whitefish, 120 miles. In Whitefish turn RIGHT (North) onto Baker Avenue, City Hall will be on your right. Head (North) over the viaduct, go straight onto Wisconsin Avenue through the lights. Three miles ahead, turn RIGHT (North) onto Big Mountain Road. Five miles up you will see the turn-off for Ptarmigan Village. Take the first road to the right and head down to 'Big Salmon' #83 and enjoy!!! 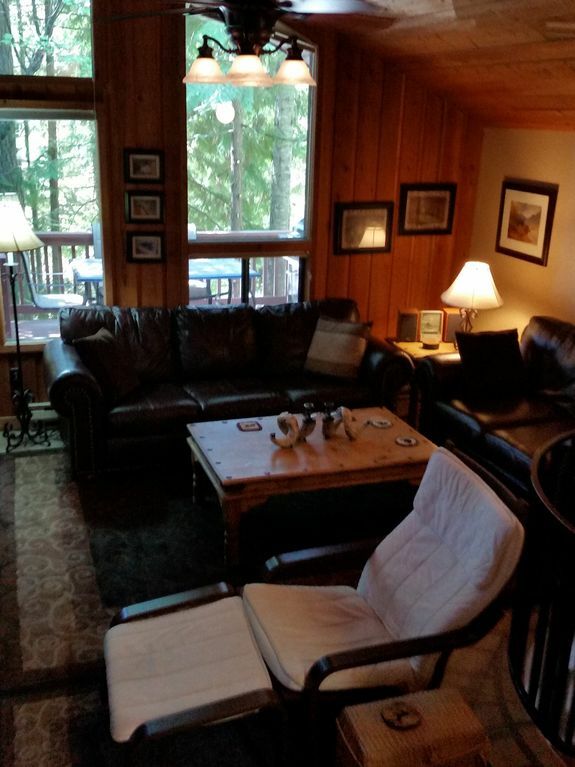 Indoor Pool with Sauna (shared), Outdoor Pool, Washer/Dryer (shared), Kids Fishing Pond and Playground, Private Beach Access with Barbecue Area at Whitefish Lake. This was a Christmas holiday ski trip with my three kids on college break. I had skied Whitefish a few years earlier and wanted them to experience it. Will's property was in a perfect location, maybe a mile below the ski lodge, and very close to a Nordic ski trailhead as well. Very clean and cozy, enough kitchen supplies to make meals on the nights we dined in. After a full day of skiing, it was nice to light a fire and settle in for games or a movie in the sitting room. Pool and laundry facilities were close at hand and a welcome bonus as we took advantage of the hot tub after coming down from the slopes. Will definitely come back another time! Thanks for staying with us and your comments. It is always nice when our guests enjoy their stay and that we have met their expectations. We would love to have you return again. Love staying at Ptarmigan Village! We appreciated that the owner was very quick with responses & it was easy to make a last minute weekend getaway happen! The condo is set up well and the kids loved the log bunk beds. Loved the location. The condo has been well kept and very clean. Our one concern was with the bed linen in the larger of the two rooms. The bottom sheet didn’t fit and wadded up. Uncomfortable. Otherwise very nice accommodation and Will was excellent to work with. Whitefish is a great place to visit and this place is well located to town and glacier. We had a great time in Whitefish and the property is in a great location. Will was wonderful to work with. It is close to town and if you want to ski it is an easy drive to the slopes. It was a little high on the cost side compared to other VRBO's but probably not out of line for the area. The cabin is very well stocked and you should not want for anything. There are a ton of great places to eat in Whitefish. We shared the cabin with another couple in their mid 70's and we are in our late 60's. The spiral stair case is small which made it difficult to move large suitcases up and down. I am so happy we could provide a quiet place for you to spend some quality time in Whitefish. If you should return, please keep us in mind. Thanks again for staying with us. We had everything we needed, that was awesome! We would stay again. It was convenient to the things we were wanting to do. Stairs were a bit steep for someone with back issues. Nice looking area. Thanks for staying with us and please do return. I am glad you enjoyed your visit to Ptarmigan Village and staying in our condo.